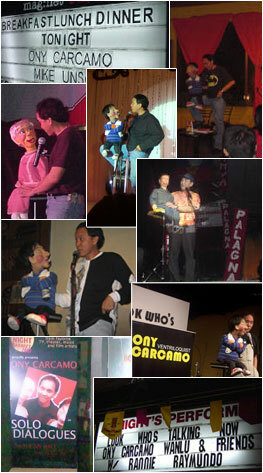 Ony Carcamo is THE FIRST and THE ONLY Filipino ventriloquist who regularly performs in adult venues. He has successfully taken this amazing ancient theater art form from afternoon children's parties to mainstream nightclub entertainment. Ony has opened shows for our top local comics, such as Tessie Tomas, Jon Santos, Candy Pangilinan, and Willie Nepomuceno. He has also shared live comedy stages with our best Improv groups, like the Philippine Playhouse Theater, Big Bang Cheery, and SPIT (Silly People's Improv Theater). In August 2007, he became the very first to have performed a full-night adult comedy ventriloquism show in the country when he mounted his one-man act, "SOLO DIALOGUES" (which he also wrote and directed), at the Cultural Center of the Philippines Silangan Hall. Whether your event is a birthday party, anniversaries, family or class reunions--Ony's act will definitely make it more fun and memorable! Click below to watch a clip of Ony's performance for adult audience (please download & forward the video to about the 6-minute mark, it's only then that Ony's show starts).